I finished all upland game slams! Variety is the spice of life. This common idiom is especially true when talking about upland game hunting in Utah. Back in September, I wrote a blog about the upland game slam program and accomplishing my first slam (First Fur or Feather). Well, it’s been a couple months and I have completed the other four slams. What an exciting adventure. 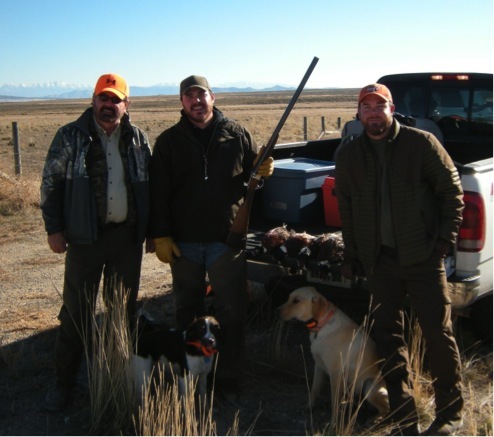 I hunted Gambel’s quail in the Mojave Desert, ptarmigan in the peaks of the Uinta Mountains, ruffed grouse in the aspens of the Wasatch Front, pheasants in Cache Valley and chukars 20 minutes from my home. Jason with his dad, brother and dogs. The variety of upland game in Utah is one of my favorite parts of hunting. I write a lot about my two dogs, Trigger (a brittany) and Gauge (a yellow lab). They provide the greatest enjoyment for me while hunting in the wilds of Utah. Having two breeds that hunt totally differently is really the key to my success when hunting such an assortment of species. I wanted to share the stories of two of my adventures that really stand out in my mind, for totally different reasons. The stories are about the Blister Slam and the Long Tail Limit Slam. The Blister Slam requires harvesting five chukar partridge in one day; some would say that’s a nearly impossible task, and I would tend to agree with them. I have told many aspiring chukar hunters that chukar hunting is a humbling experience, however sometimes the stars align and fortune smiles down on us. That’s what happened on a beautiful autumn day in October. I decided to load up Trigger and Gauge for a chukar hunting trip to try and get one of the species for the Mountain Slam. It was just me and my dogs, hiking the steep slopes and cliffs of the west desert. There are times I love the solitude. To quote Thoreau: “I have never found a companion that was so companionable as solitude.” Add a couple of hunting dogs and a perfect fall morning and you have my idea of what life is all about: my bliss. I pulled up to one of my favorite traditional chukar hunting locations, None’ya Canyon. You may have heard of it. As I unloaded the dogs, I heard the best noise a chukar hunter can hear: chuk, chuk, CHUK-arr. I heard chukars in the cliffs above me. Wrapping up the Long Tail Limit Slam. I told my two hunting partners to “get ’em up” and they took off like rockets. Nine minutes later, Trigger was on point. I approached him with Gauge heeling at my side; erupting from the rocks and bunch grass were more than 30 chukars. I fired twice and a single bird fell to the ground. Gauge was on top it in an instant. While Gauge retrieved the bird, Trigger was off to find more. As we approached the next ridge, Gauge raced upwind and flushed a single bird; one shot and it was down. Gauge scooped it up and delivered it. We slowly made our way across the steep hillside. Trigger had disappeared, but as I crested a small rise, I could see him on a staunch point. I took two steps his direction and a single chukar erupted 20 yards in front of us. A single shot took the bird down, and this time Trigger was able to beat Gauge to the downed bird. I had three birds in the bag, which is a great day for me. I knew there were some birds down slope of us, so we worked our way down a razorback ridge. About 15 minutes later, Trigger was on a staunch point again, standing on the point of a steep rocky cliff, the wind directly in his face. I took a mental snapshot of my dog standing on that rocky point. As I approached, he didn’t move a muscle. I paused to see if I could see the birds and all at once a large covey took off 15 yards down slope of us. I pulled up the shotgun and fired two very quick successive shots. Two birds fell from the sky. Gauge retrieved one and Trigger the other. I harvested five chukars in less than two hours! This hunt will forever be seared in my memory. I have a general philosophy that life is about the happy memories we make. This hunt in one of those lifelong happy memories. My hunting companions performed their tasks flawlessly, and I shot as good as I ever have, with the added bonus of supplying my family with a delicious chukar parmesan dinner. I was able to make a lifelong memory and find a deeper appreciation for my dogs and for the wild places of Utah. And I was able to get a Blister Slam without any blisters on my feet! 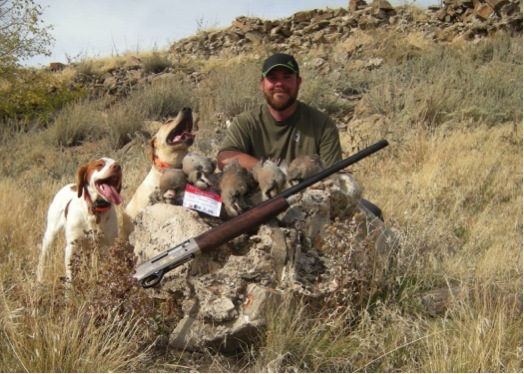 My Blister Slam story is all about solitude, time with my dogs, testing myself and my dogs, the excitement, the adventure and the challenge that is chukar hunting. The story of the Long Tail Limit Slam is a bit different. For me, pheasant hunting is a family tradition. Every year my wife and family members plan to hunt pheasants the first Saturday in November. Often other friends and relatives join us. Through the years we have helped many people, young and old, harvest their first pheasant. For me, this hunt is all about spending time with my wife, brothers, dad, in-laws, cousins, friends and anyone else that might come along. It’s about joking around, catching up on life events and laughing. Oh yeah, we usually find some pheasants too. It’s be hard not to with our usual crowd of 7–10 people and five dogs! We all arrived at the WMA we always hunt. The difference this year was it was much more crowded than in the past. But that didn’t deter us. We knew there were birds there, and we were really just looking to have a good time. Trigger, Guage and Jason just after completing the Blister Slam. We formed a traditional pheasant hunting line and released our pack of pheasant finders. The annual pheasant hunt was on! Right off the bat, my brother’s brittany, Scout, was on point. The assembly of hunters approached the pointing dog and a rooster flushed. Shots were fired and down it went. A few minutes later, a couple more roosters got up and both were added to the bags of the hunting party. The dogs worked hard as we made our way north through some old DWR pheasant habitat improvement projects. We stopped to joke with each other about something meaningless, when all of a sudden, my lab Gauge jumped into some thick cover. Two roosters came boiling up out of the tangles. Shots were fired and two more birds were added to our bags. As we sat there razzing those who may or may not have missed, a third rooster boiled up out of the same spot. This one nearly got away, but it too was added to the bag. This went on for a couple of hours, until we were either limited out or thoroughly exhausted. We sat in the parking lot of the WMA for over an hour, talking to other hunters, talking about past hunts, and future hunts and how our kids were doing. While sitting there together on the tailgate of our trucks completely enjoying life, I had a thought: this is what life is all about, this is my bliss. (I feel like I’ve said that before). 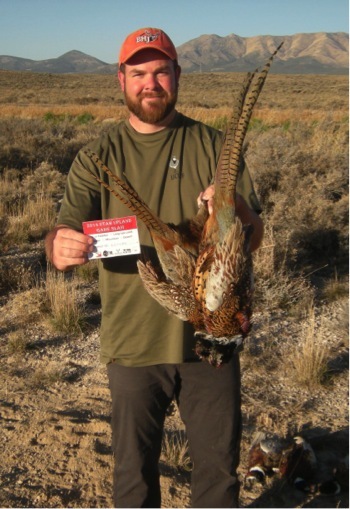 There are seven different upland game slams offered here in the state, and the money generated will go to upland game projects in Utah. If you haven’t joined in on the fun, there’s still plenty of time. Many of the hunts are open until February. So join the program, help Utah upland game and enjoy spending time by yourself or creating long-lasting memories with friends and family (I consider my dogs family)!